Civil litigation and criminal law attorney Michael Thomas Lynch provides legal counsel for individuals and business owners in Auburn, California, and throughout Placer County. 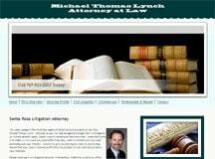 As a solo practice lawyer, Mr. Lynch understands the importance of working closely with every client. With a reputation for responsive communication and vigorously protecting his clients' rights, attorney Lynch will work hard to ensure your legal difficulties are efficiently and effectively put behind you. To discuss your legal needs or to schedule a free initial consultation, call the law firm today. Office hours are Monday through Friday, 8:30 a.m. to 5 p.m. Weekend and evening appointments may be available by special arrangement. Visa and MasterCard are accepted for your convenience and translation services are available. Monday Through Friday 8:30 a.m. to 5:00 p.m. After Hours Available by Appointment.